Received his Ph.D. in Electrical Engineering at the Utah State University (USU) in 1987 under advisor Professor Rex Megill who started the annual Small Satellite Conference at USU. Also received his M.S. in E.E., M.S. in Computer Sciences and M.B.A. from the same university. His B.Sc. was from Ohio State University in 1975. He had teaching experience at the USU and the King Mongkut University of Technology in Thailand. Between 1992 and 2001, he worked as a Senior Principal Engineer at the Orbital Sciences Corporation, Dulles, Virginia. He designed, developed and tested many satellites including the flight computers on the SeaStar (OrbView-2 or SeaWiFS), downlink subsystem on OrbView-4, Pegasus Rocket separation interface, and others. Also he worked on the Mercury Laser Altimeter on the Messenger spacecraft at the NASA Goddard Space Flight Center. While at Orbital, he received the 1994 Orbital Technical Achievement Award. Between 1978 and 1982, he was the head of electronic division in E.E. department at the King Mongkut University of Technology. 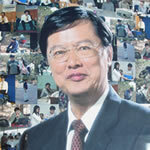 He was the first lecturer there to receive the Thai National R&D Award. He was responsible for introducing microprocessor class to the university. Also he developed the first microprocessor-controlled robot for Thailand in 1982. Currently he is retired and only works part-time at NSTDA. With help from many high-school students, he is building a 4-place, 350 km/hr., 2000 km range kit-plane.